The time-saving 924HC Hydraulic Post Hole Digger offers easy reach and access to difficult areas. Attachment features include exceptional up-front visibility and control, and the ability to apply down pressure for productivity in difficult conditions. A large selection of augers are available, with hardened alloy steel teeth for tough digging. Reversible rotation permits quick backout when unusual obstructions are encountered. 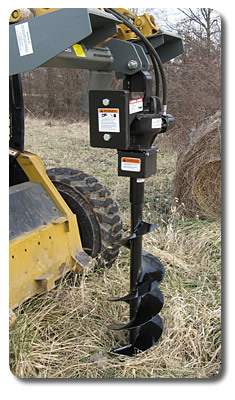 Without leaving the seat, operators can dig hundreds of holes for fence posts, utility poles, sign posts, trees and shrubs, foundation footings and other applications with this hydraulic post hole digger attachment. View our literature. Provides the ability to reverse the auger should it become entangled in roots or rocks. No need to replace shear-bolts or repair slip clutches. No PTO lifting restrictions with the tractor, loader, or backhoe boom.